Checking in at 5 feet 5 inches tall and 125 pounds, Carrboro High School boy’s lacrosse player Jake Melville is used to being one of the smallest players on the field. But the junior attacker is also used to slashing through lacrosse sticks and swerving through open space. He’s used to tricking defenders and tormenting goalies. In the 2016 season, Melville has scored 26 goals and dished out 16 assists, making Carrboro’s smallest player one of the team’s biggest offensive threats. 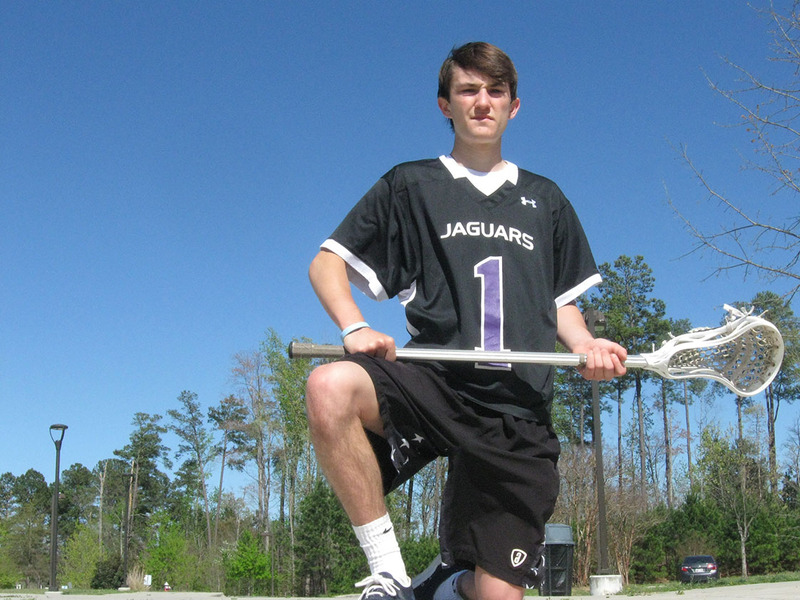 Melville — a resident of Chapel Hill — said he began playing lacrosse in seventh grade. He’s played all three years at Carrboro, and none have been better than his junior season. The Jaguars are 9-0, which is the best start in school history. Despite his diminutive frame, Melville leads the team in goals and points, and he is second on the team in assists and shots on goal. Melville’s father, Gregg Melville, said that he might be the reason for his son’s height. But Gregg said Jake’s height does not hold him back on the field. Carrboro coach Ron Mitchell said Jake’s biggest strengths are his tenacity, speed and field awareness. Mitchell added that he isn’t surprised Jake is succeeding with his small size. Senior defender Luke Knowles said he often goes up against Jake in practice to improve his defensive skills. Knowles said Jake is difficult to guard because he is agile with both his feet and his stick. Jake, who scored 17 goals last season, said he had to step into a larger role in 2016. The team is without William Cordes, who led Carrboro with 37 goals in 2015. Cordes transferred to Trinity-Pawling School, a small boarding school in Pawling, New York. This season, the junior attacker was voted as one of the captains. Jake said his responsibilities include running the attack line, making sure everyone knows the plays and maintaining players’ focus during practices and games. Jake said the team owes its success to last season’s 8-7 loss to Chapel Hill High School in the second round of the 2015 state playoffs. The Jaguars avenged their playoff loss by defeating Chapel Hill 9-6 on March 24. It was Carrboro’s first ever victory over Chapel Hill in boy’s lacrosse. Jake had three goals in the win. Jake said that a coach has never told him he is too short, but some have said that he should eat more and bulk up. Whenever he hears that, the junior attacker said that he is reminded of what his middle school basketball coach once told him. Don’t worry about things you can’t control — like getting taller. Now, Jake said he only focuses on continuing to work on his craft. “It is nice to be tall and all, but height doesn’t really matter in most sports,” Jake said. “It also matters on your skill level.